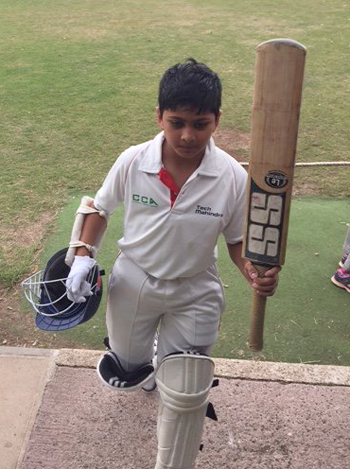 Young Ved Patel hit an amazing 153 not out. Following on from their sensational first two games, the CCA boys were the talk of the town before preparing for their last game against Cambridgeshire. A win was needed to ensure winning the championship title, and they were up against a team with some very talented players. CCA won the toss and elected to bat and the opening combination of Ved Patel and Daniel Amirtharaj resumed their successful partnership with their third stand of over 80, broken only when Daniel was bowled by the leg-spin of Jack Harding. Jack’s probing spin and accuracy flummoxed the batsmen causing CCA to lose wickets in quick succession. Ved, after another fine innings was run-out for 88 by a direct hit from the boundary. Some late hitting brought the total to 198, but it was clear that this wasn’t an easy pitch to bat on. Cambridgeshire showed great determination in their pursuit of the target as the CCA pace bowlers of Aman Rao and Rohith Bharanidharan were extremely tight and gave very little away. A steady start finally ended when Hari Nair bowled Tom Newman, but by then, the other opener Will Routledge was in the groove. It was here that outstanding bowling and fielding was needed and CCA delivered. Every bowler contributed but special mention must go to Hari and Anuvrat Shukla who bowled tight spells which frustrated the batsmen and allowed the asking rate to increase. The old adage of “never run on a misfield” was ignored, resulting in the run-out of Will and then Keshav Balaji came on and bowled a superb spell increasing the pressure. Nevertheless, Cambridgeshire kept going and the crowd started to get more anxious and animated. Adding to the suspense, Somerset were closing in on a win on the next field which meant that CCA had to be successful in this game, or the title would go to Somerset for a fourth successive year. If the boys were nervous, they didn’t show it and when a ball was skied in the air off Rohith, it was calmly taken by Aman at mid-wicket, edging CCA closer to a win. Eventually 18 was needed off the final over and Keshav bowled excellently crowning CCA the champions of the West Cricket Festival! The presentation ceremony was a sight to behold as the other teams started chanting the names of Ved and Danny who had made such an impression on the tournament. The West Cricket Festival has never seen anything like this before as a team which went there to test themselves against high quality opposition ended up being the biggest test of all for the other teams. This tour was sponsored by Tech Mahindra and Think Palm Technologies.